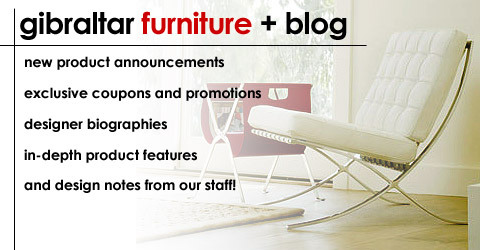 GIBRALTAR FURNITURE (800 416 3635) INTRODUCES THE NELSON COCONUT CHAIR. Originally introduced in 1955, the Nelson coconut chair is again available after a 23-year hiatus. This 20th century furniture icon has a simple, striking shape, and is a very comfortable place to unwind at home, in the office, or at the studio. It is available now for the introductory special price of only $995. Other stores sell the Herman Miller version of this chair for $3899! Our Coconut chair features a white fiberglass shell, a chrome leg frame, and 100% Italian Leather construction. This coconut chair is completely true to George Nelson’s original design, materials, and detailing. With the unique shell design, he accomplished his goal of providing comfortable and attractive lounge seating that allows free movement so that people can sit in just about any position they choose. George Nelson (1908 – 1986) was one of the founders of American modernism, along with Charles and Ray Eames. George Nelson was born in Hartford, Connecticut. He died in New York City. George Nelson’s catalog design and exhibition designs made him a vanguard pioneer in the field of American design. At one point Ettore Sottsass worked at his office. He was without any doubt the most articulate and one of the most eloquent voices on design and architecture in the U.S.A. of the 20th century. In 1971 he received a grant from the Graham Foundation for his project “Hidden Cities”. Modern Outdoor Furniture for Summer 2008 Limited Time Offer: Free Shipping on all Serralunga Planters + Pots!